A telephone call advising us of the availability of horse apples in a paddock 2.4 miles away. Hah! - an opportunity to test and report on the efficacy of my wagon. Gathering horse apples (Squeamish of London does not yet need to know this but soon will, what with Sir David http://www.off-grid.net/2010/03/22/peak-oil-back-in-the-news/ informing the Internet that peak oil has been rescheduled from 2030 to 2014) is best accomplished with rubber gloves. A shovel is all very well for stables I daresay, but paddocks have lots of holes of exactly the same size and shape as a horse's hoof and they also grow all the rough weedy twigs that Amber won't eat and the sweeping action of a shovel is much impaired by this terrain. And horse apples are discrete - I said Squeamish of London wouldn't want to know this - and sufficiently robust to be gathered in handfuls. Your farmer's daughter uses a huge nylon bag designed for builders' gravel but we find that plastic dustbins have the advantage of lids, for lids prevent the van interior from reeking of horse produce. Moreover you cannot pick up a gravel bag containing 400kg of fresh compost. You can pick up a 50 litre plastic dustbin when you have filled it, but you cannot pick up a 50 litre dustbin when your wife has filled it because she shoves as much in as she can and compresses the load. You definitely can't pick up a full 75 litre bin if of middle years and if you want walk upright again. 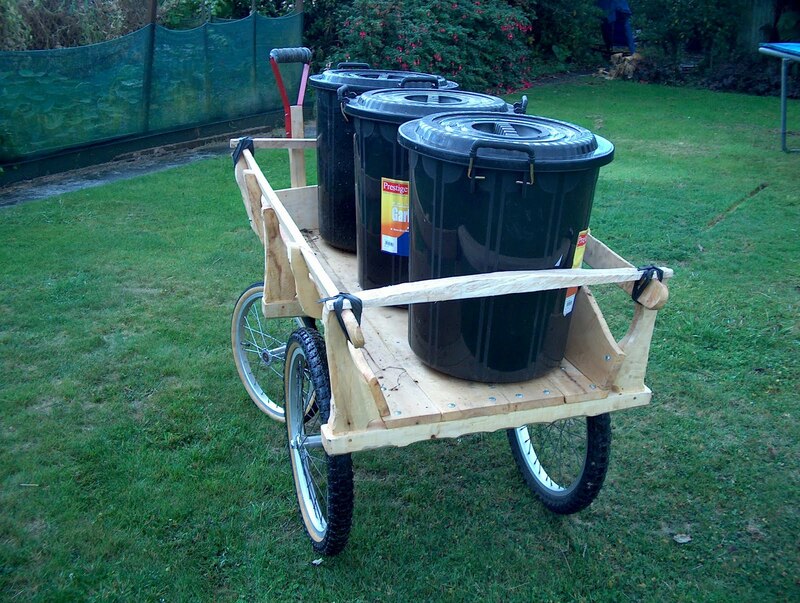 Three dustbins fit into a four foot wagon though it doesn't need to be 17 inches wide. Ten inch sides are just about high enough to stop dustbins falling out provided the paddock's level, and the wagon definitely needs to have a back. - But it has to be able to drop down. If you've been lazy and lashed a beam across the back with strips of innertube then you're lifting bins over an unnecessary 10 inch hurdle to get them out of the wagon and into the van. - A twenty inch bed height is about right for transfer from wagon to van. Twenty inch wheels manage horse-hoof-holes in paddocks, while 16 inch wheels bounce and jostle quite a bit, though the advantage of full lock is a worthwhile compromise and you're dead glad you fitted the front axle with springs. Small front wheels just mean you have to pull the wagon slowly over a paddock. Either the rubber gloves have to be large enough to slip off and on easily, or you bind the wagon's handle with a strip of inner tube beforehand. Unless, of course, you're content to accept a subsequent veneer of horse manure. A rubber strip to hold the unsupported handle upright and prevent it falling into what you're about to collect, is a great boon. So if horse apples are to become more prominent in our garden's life then the new wagon is a vast success. But Juno Watt? Certain obstinate people prefer to drag the dustbins across the paddock. Use of the wagon would constitute tacit praise. - A prophet is not without honour, 'cept in his own house etc.